Since 1929, Mertz Sausage took great pride in producing the best tasting sausages using only the finest ingredients. This little gem, located in San Antonio’s westside, is the original locally owned, operated and USDA inspected plant where folks have been coming for decades; still providing quality, wholesome products at a low cost through dedication, honesty and integrity. Providing high quality products that are flavorful using the finest, high quality ingredients with a wholesome family - oriented and dedicated staff. We are a sausage producing factory that focuses on fresh, daily production of the most flavorful, delicious, mouthwatering meats you’ll taste in Texas. All of our products at Mertz Sausage are made using only premium, high quality and natural ingredients. Our production process allows us to create unique flavors to meet the needs of all our customers. We can follow any recipe but we’re also really good at customizing sausage allowing for great partnerships with private labels and creating a product beyond your expectations. Our products are carried by our various retail partners. If you cannot find what you are looking for at the retail store, please call or stop by at our plant. Home of the 10 pounder! Hot and Garlic available by special order. This is the best German style sausage in South Texas. My favorite day to shop is Thursday the only day of the week that German Dinner Sausage is available. I also get a dried sausage ring. These two items are limited production and sell out quick. I love their garlic Polish sausage. 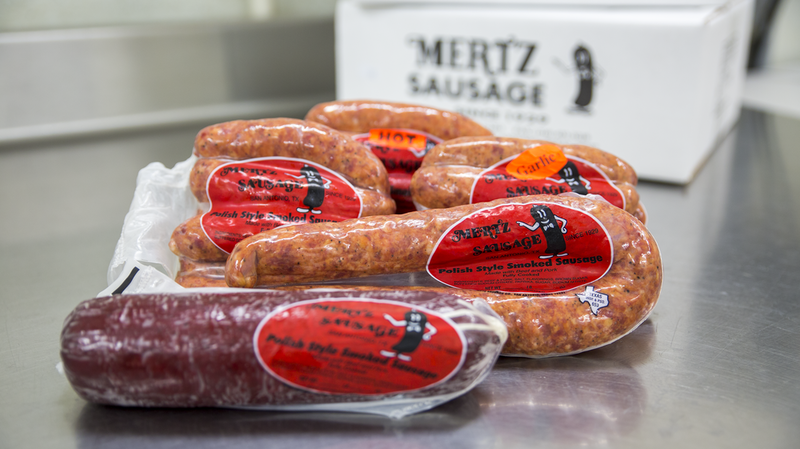 Mertz has some of the best quality and very delicious tasting Sausage products in the San Antonio area. My family used to drive through Cupples road often and I always wondered how it was like to taste their products. One day i finally bought some for myself and have loved them ever since. Now my own family loves eating the Beef and the Polish sausages. I highly recommend them to everyone! We accept the following methods of payment: Cash, EBT and Business Checks.